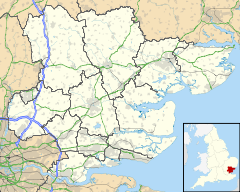 Birchanger is a village, civil parish and electoral ward in Essex, England. It is located 3 km (1.9 mi) northeast from Bishop's Stortford, Hertfordshire and is 25 km (16 mi) northwest from the county town of Chelmsford. The village is in the district of Uttlesford and in the parliamentary constituency of Saffron Walden. There is a Parish Council. The local CoE church of St Mary the Virgin, dating from the 12th century, is a grade II* listed building. The village has a cricket, bowls and football club. It lies close to London Stansted Airport, which is 3 km (1.9 mi) to the east and is 2 km (1.2 mi) south of Stansted Mountfitchet. It is also the site of Birchanger Green services, a motorway service station on the M11 motorway. According to the 2001 census it had a population of 987, increasing to 1,589 for both the ward and civil parish at the census 2011. In the 12th Century the village name in old English was recorded as "Bircehangra" which means "Wooded slope growing with Birch trees". This name is still appropriate today as parts of Birchanger Wood still exist and still contains many Birch trees (which are protected). ^ a b "Ward/Civil Parish population 2011". Neighbourhood statistics. Office for National Statistics. Retrieved 26 September 2015. ^ a b "Uttlesford Information regarding Birchanger". www.uttlesford.gov.uk. Archived from the original on September 27, 2007. Retrieved 2007-01-27. ^ Historic England. "CHURCH OF ST MARY (1322445)". National Heritage List for England. Retrieved 2 May 2014. ^ "Birchanger Parish Council Agenda and Minutes. Agenda and Minutes 2009. Annual Village Meeting". This page was last edited on 16 April 2018, at 19:07 (UTC).